As promised, here is the tutorial that will make you sew coats and jackets all day and night: how to sew the lining within the coat. This is obviously not the only way to do it, but for me it is the simplest. 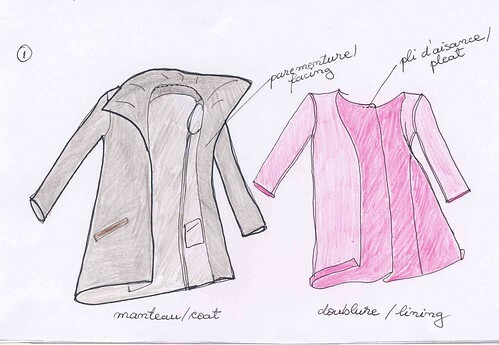 Sew the sleeves, the pockets, the front facings and the collar of your coat. Iron, bend and baste stitch your collar as shown in the tutorial on preparing collars. Attach the collar to the back neckline (if I speak Chinese, you should read a tutorial on the shawl collar). Interline and iron the sleeves hem and bottom hem. Sew your lining like a coat. Attach the mid-back pleat and mark a hem of 1.5 cm from the edge with the iron. Turn the coat sleeves wrong side out, open the front facings flat and put the coat right side up. Also put the lining wrong side up. Before continuing, make sure that you have marked the notches on both the facings and lining. With right sides facing, sew the lining with the facings along the outer edge. Press the seams open. 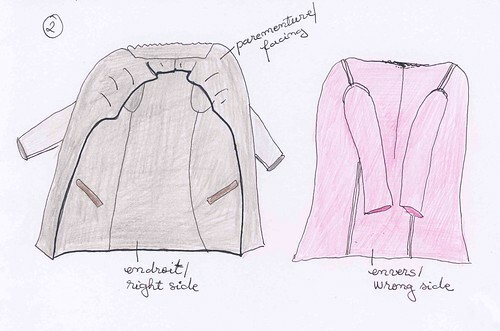 Drag your coat facings toward you as shown in Figure 4. 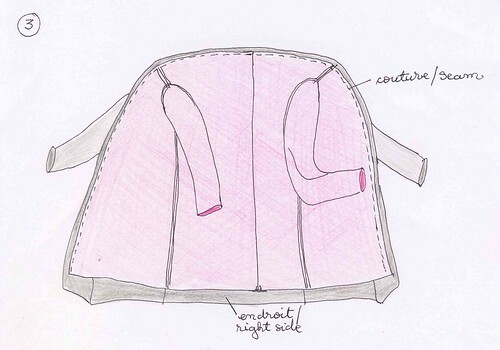 Attach a lining sleeve with a coat sleeve and sew over the edge as shown in Figure 5. Repeat the same process for the second sleeve. 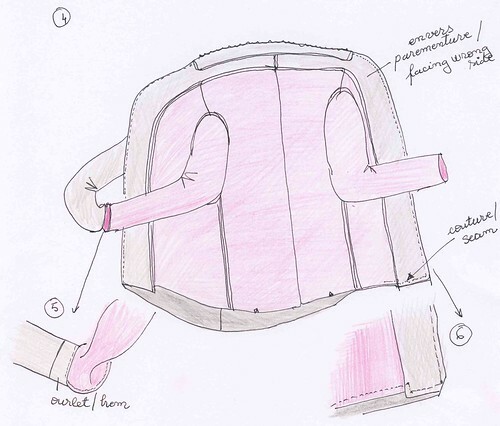 Sew the hem coat as shown in Figure 6. Start with the outer corner, attach the front facing with the front coat. Giving that the lining is shorter than the coat, you need to make an angle to attach the lining on the coat. Stop sewing 15 cm before the center back line. Turn your coat right side out through the opening. Drag the lining sleeve inside the coat sleeve.Drawing a picture to illustrate this step has been proved more difficult than bagging the coat lining but I guess you have already sort it out. Slip stitch or invisibly stitch the opening on the bottom of the coat. As the lining is wider than the coat, you must close the pleat when hand stitching. And now your lining is well inside your coat. We can all agree that tailors don’t work like this.This tutorial applies to rather soft coats, that can undergo manipulations described above and not for well structured shoulders.I suggest you to also read the tutorial of Grainline and Coletterie and to choose the best method for you. 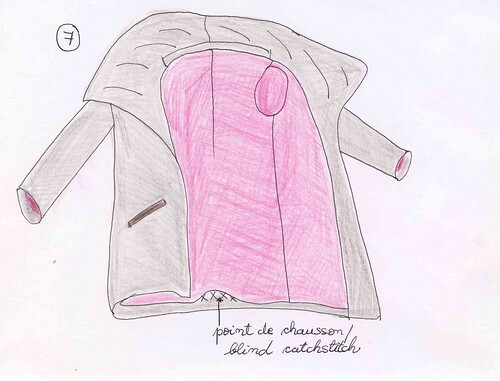 This entry was posted in Tutorials and tagged coat, lining. Thank you for this great tutorial & designs how to sew the lining. I’ve read some tutorials on the net, but yours is easier to understand (for me who a new beginner in sewing ). And big hanks for your tutorials about drafting lining as well.